This 5-inch handset is expected to arrive during a special event later today, powered by a Qualcomm Snapdragon 615 SoC. Also known as "The Flagship Killer," OnePlus One is one of the most notorious Android-powered handsets to come out this year. The handset powered by Cyanogen's aftermarket firmware was announced back in April, and now it looks like a more affordable "mini" version is on its way. Nothing is official yet, but it may become that way in less than a day since OnePlus has scheduled a special event for today. The shots that appeared on Chinese social network Weibo do not seem to reveal much about the handsets design so this may even be a prototype and not the final product that will reach the market. On the other hand, there is a screen that shows AnTuTu's interface with some useful information. The OnePlus One Mini is expected to feature a Qualcomm Snapdragon 615 SoC, two 8 MP cameras, as well as Android 4.4.4 KitKat. This latest leak does not say anything about the price or availability of this handset. 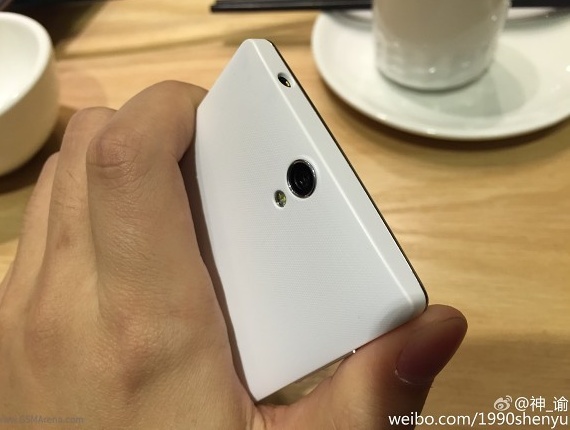 In the end, its name may not be OnePlus One Mini, and it may not even be a OnePlus handset. We will get back to it as soon as we hear more.